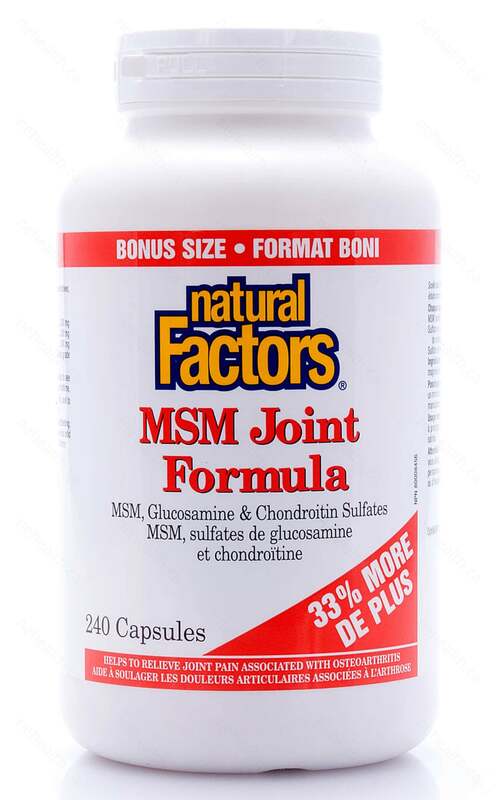 Natural Factors MSM Joint Formula offers a high-caliber, natural solution for joint pain. Using a potent mix of MSM (Methyl-sulfonyl-methane), Glucosamine Sulfate and Chondroitin Sulfate, this formula helps to improve lubrication of joints, decrease inflammation and helps to repair cartilage. It may also relieve joint pain associated with osteoarthritis and protect against cartilage deterioration. 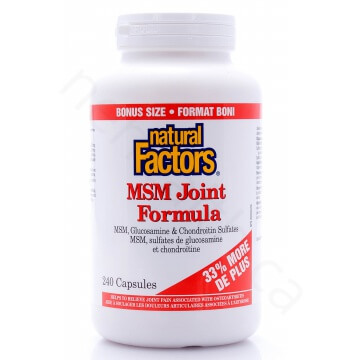 What are the key benefits of Natural Factors MSM Joint Formula? How do the Ingredients Help to Ease Joint Pain and Stiffness? Glucosamine Sulfate stimulates production of key components of cartilage which acts as a cushion in joints. It also stimulates the repair of damage, helps with pain and inflammation, lubricates and maintains already healthy joints. Chondroitin Sulfate actively helps to block enzymes that break down joint tissue and helps to maintain the fluid around joints to provide cushion and comfort. MSM helps to form connective tissue in joints and muscles and as a side benefit, plays a role in healthy skin, hair and nails. It also helps to slow down the breakdown of cartilage and modulate the body’s inflammatory response. All three ingredients together improve mobility, reduce pain and help to rebuild joints. In France, 50 patients with osteoarthritis of the knee were given 800 to 1,200 milligrams of oral chondroitin sulfate or 500 milligrams of pain killers. Cartilage samples taken at the beginning of the study were compared with samples taken after three months. The cartilage of patients taking chondroitin showed significant repair. Gelatin capsule (gelatin, purified water), vegetable grade magnesium stearate (lubricant), rice starch. 5 capsules daily with food or as directed by a health professional. McAlindon, Timothy E., et al. "Glucosamine and chondroitin for treatment of osteoarthritis." JAMA: the journal of the American Medical Association 283.11 (2000): 1469-1475. Houpt, J. B., et al. "Effect of glucosamine hydrochloride in the treatment of pain of osteoarthritis of the knee." The Journal of rheumatology 26.11 (1999): 2423-2430. Reginster, J. Y., et al. "Long-term effects of glucosamine sulphate on osteoarthritis progression: a randomised, placebo-controlled clinical trial. "Lancet 357.9252 (2001): 251. Leeb, BURKHARD F., et al. "A metaanalysis of chondroitin sulfate in the treatment of osteoarthritis." The Journal of rheumatology 27.1 (2000): 205-211. Trentham, David E., Alexander S. Townes, and Andrew H. Kang. "Autoimmunity to type II collagen an experimental model of arthritis." The Journal of experimental medicine 146.3 (1977): 857-868.